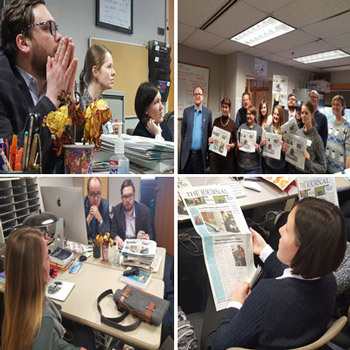 A Russian delegation of journalists visited Webster's student newspaper office on Dec. 8. The Journal, Webster University's student Newspaper, welcomed a small delegation of Russian journalists on Dec. 8 to discuss and compare the student media process between the United States and Russia. The delegation enjoyed the interaction, asking students questions such as whether The Journal endorsed a candidate for president, whether it faces restrictions on what ads to run or censorship, how its journalists use social media, and what careers journalism students follow after graduation. The delegates were taking part in a Congressionally sponsored Open World Program, which brings young political and civic leaders from Russia and nine post-Soviet states to the United States for short-term professional trips. Don Corrigan, professor of Communications and Journalism in Webster's School of Communications and the editor of the Webster-Kirkwood Times newspaper, facilitated the delegation's visits to the Times and to the Journal.